The high-voltage power pack EN 70 / EN 70 LC / EN 70 RLC is a powerful and hardwearing unit. Its design fulfills all electrical engineering requirements. 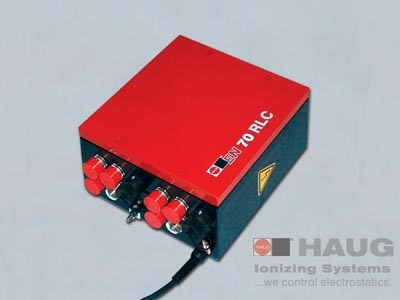 The EN 70 / EN 70 LC / EN 70 RLC power pack is used in fast-running machines in combination with tandem ionizing bars. It is equipped with two transformers which operate by 180° out of phase and four high-voltage terminals each. Any surface charges which might disrupt production will be removed reliably and effictively using the HAUG ionizing unit – even at high operation speeds. The power pack EN 70 RLC has two additionally relay contacts for fault signals. The HAUG System X-2000 coaxial high-voltage plug-and-socket connection offers a unique benefit. The airtight high-voltage plug can be connected to HAUG power packs without any tools. The highly flexible coaxially shielded safety cable is used to connect the ionizing unit to the voltage supply source. Due to its round design, the tandem ionizing bar EI RD / EI VD / EI HRDallows a pin-point rotary adjustment to the running direction of the material. The ionizing bar is absolutely safe to touch. Low-wear special electrodes ensure a long service life. The design fulfills the most significent requirements imposed by the mechanical engineering industry. Identical to power pack EN 70 LC, but without integrated watchdog function. The example given is based on a web speed V = 900 m/min. The bars are mounted at a distance of 32 mm and designated S1 and S2. These designations are also indicated on the relevant voltage curves. The ionizing effect is indicated for times t1 and t2. HAUG power packs EN 70 and EN 70 LC should be used in combination with tandem ionizing bars mounted above and below the material web.